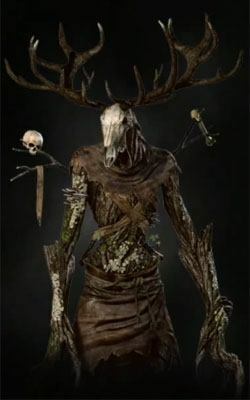 Leshen is a Creature/Monster in The Witcher 3: Wild Hunt. If you're looking for the Monster Hunter World collaboration, please the the Leshen page on Monster Hunter World wiki. Leshens dwell in dense, primeval woods. Fiercely territorial creatures, they hunt with stealth and cunning as their only companions. They use their inborn magic to control the plants and animals within their territory — and so when stalking them, half the battle is merely getting near enough to strike. Leshens old enough to earn the appellation "ancient" wield advanced skills and tactics that make them particularly dangerous. " Forest Wilderness of Velen, near Dragonslayer's Grotto. NW of Aeramas' Abandoned Manor, there is a dense forest area with a Guarded Treasure sign in the middle of it. A Leshen is guarding it. One can be found in a forest NW of the Lakeside Hut at Kaer Morhen at a Guarded Treasure sign. One can be found in a forest on Skellige east of the village Sund as part of the contract "In the Heart of the Woods". You can kill one for a reward in the forest SW of Novigrad Docks, SW of a Loggers Hut. Leshens are quite vulnerable to Igni, though burning will not incapacitate them. Their movement is slow but their srikes are powerful and they have potent ranged attacks. A Leshen may summon roots or crows to attack you, these attacks target a line directly in front of the Leshen. Leshens are able to teleport by transforming into crows and Ancient Leshens can summon wolves. You can predict where the Leshen will manifest by following the movements of the crows. Because of their ranged attacks it is advised to circle around the Leshen and aim for its vulnerable back. Based off of a mythological creature called a "Leshy", comes from the Slavic term for "forest" ("les"). Someone need to add trivia, There are event regarding Monster Hunter World X The Witcher 3 related to this beast. I got *****ed by the level 99. I encountered this enemy for the first time at lvl 7 in the dragonslayer&apos;s grotto boss room. It was both him and Ekimmara. I was able to kite Ekimmara around and kill him without engaging Leshen until after I killed Ekimmara. I&apos;m not sure if it was because of the limited size of the room so he couldn&apos;t travel very far on teleports, but it actually wasn&apos;t too difficult considering the difference in level. Got attacked by a level 20 at level 6. I&apos;ve never run so fast. stupidest monster ive ever fought, got like 3-5 hits on him, then he teleports, i have to wait 5 seconds, 3-5 more hits... and hes completely harmless when u got quen up. Based off of a mythological creature called a "leshy". The term "leshy" comes from the Slavic term for "forest" ("les"). All Slavs had great respect for forests, mountains and water. A leshy was something like the master of the forest. It was everywhere in the forest and did not like when someone entered into its dominion, but it never left the forest.If a human spied a leshy in the forest, it was most likely that he had lost his way. Folk tales told that to find his path again, he had to turn all his clothing inside-out. Have the say the first time I ran across this guy I was like WTF OP. Then he kept teleporting to me inside of a cave in one shotting me. He was making me super angry! So I faced him in open battle... Once you figure out his mechanic he&apos;s actually pretty straight forward to kill. Just roll around behind him while he&apos;s casting/teleporting and then whack him a few times with your sword. Took about 10 minutes to kill him, but it was a fun fight in the end. Oh and he&apos;ll summon the occasional wolf. Make sure you keep Quen up. Keep relic oil up on your sword, and igni/axii him whenever you get a chance and you&apos;ll do OK. Killed him as a level 8.